Sherwood Anderson became a published author of fiction relatively late in life. As a young man he had written articles and essays for such regional periodicals as Agricultural Advertising, but his short stories were routinely rejected by publishers and his attempts at novel-writing went nowhere. His primary employment was as an advertising copywriter, and he owned a small business selling household products. But in 1912 the Anderson Manufacturing Company began to fail. On Thanksgiving Day, he left his office, walked toward Cleveland for four days (sleeping outdoors), and sent his wife a fairly incoherent seven-page letter describing his experiences. He was admitted to a hospital in Cleveland, and in early December a local newspaper reported the episode, attributing his behavior to “nervous exhaustion.” Eventually he recovered and his first published story, “The Rabbit-pen,” appeared in Harper’s in July 1914; two years later, at the age of forty, he finally published his first book, the novel Windy McPherson’s Son. Incredibly, no publisher has ever gathered Sherwood Anderson’s four story collections into one book—until now. 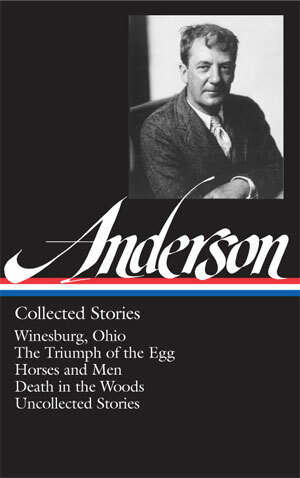 At the end of this year, The Library of America will publish the most comprehensive volume of Anderson’s stories ever published—containing Winesburg, Ohio; The Triumph of the Egg; Horses and Men; and Death in the Woods, plus fifteen stories that Anderson didn’t include in these four landmark collections. Ray Pearson and Hal Winters were farm hands employed on a farm three miles north of Winesburg. On Saturday afternoons they came into town and wandered about through the streets with other fellows from the country. . . . If you don't see the full story below, click here (PDF) or click here (Google Docs) to read it—free!